An armed soldier patrols a street in Harare, Zimbabwe, Nov. 15, 2017. Zimbabwe’s ruling party has claimed on social media that President Robert Mugabe and his family were detained Tuesday night in what increasingly looks like an attempt to depose the longtime president. The Twitter account has previously been used to air the party’s beliefs, though it was not possible to independently verify the claims. The tweet refers to recently deposed Vice President Emmerson Mnangagwa, who Mugabe last week accused of disloyalty and plotting to seize power. Mnangagwa’s whereabouts early Wednesday were unknown -- South African officials would not confirm rumors that he is in neighboring South Africa, although members of the powerful military veterans’ association told reporters last week that he was planning to come to South Africa after he fled Zimbabwe last week. 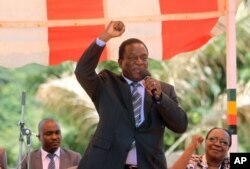 FILE - Zimbabwean Deputy President Emmerson Mnangagwa greets party supporters at the ZANU-PF headquarters in Harare. The claim adds to the military’s statement early Wednesday, delivered after soldiers took over state television, that the army is not carrying out a military takeover of the government and that Mugabe and his family are safe. However, the situation remained tense in the capital as Zimbabweans both inside and outside the country watched and wondered about the fate of the 93-year-old president, who has ruled the Southern African nation since 1980. In that time, the economy has all but collapsed and Zimbabwe has become a pariah state in the West over allegations of human rights abuses. "We are only targeting criminals around him who are committing crimes that are causing social and economic suffering in the country in order to bring them to justice," he said. In this image made from video, Major Gen. S.B. 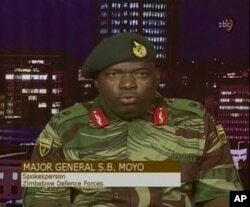 Moyo, Spokesperson for the Zimbabwe Defense Forces addresses to the nation in Harare, Zimbabwe, Nov. 15, 2017. The announcement followed witness reports of at least three explosions and heavy gunfire in the capital city of Harare early Wednesday. Witnesses also said military vehicles and soldiers were on the streets early Wednesday, hours after soldiers took over state broadcaster ZBC. Local residents said instead of the usual 11 p.m. newscast, music videos were played. A spokesman at the U.S. embassy in Harare told VOA the streets appeared calm and had no confirmed sightings of military vehicles. The embassy warned Americans via its web site to "shelter in their residences" and work from home on Wednesday. They said the embassy will be minimally staffed and closed to the public. The Canadian Embassy, via Twitter, reported “increased military activity in Harare” early Wednesday, but did not give details. The embassy, they said, will be closed Wednesday. A State Department official said the United States "encourages all Zimbabweans to approach disputes calmly and peacefully while following democratic, transparent, and constitutional processes for resolving differences." On Tuesday, Zimbabwe's ruling party accused the armed forces chief of "treasonable conduct" after he threatened to intervene in the country's political affairs. The statement from the ZANU-PF party was released amid worries that the military might be taking action to oust Mugabe. Witnesses Tuesday reported tanks and armed personnel carriers moving on roads outside the capital. The current tension was sparked last week when Mugabe fired Mnangagwa. 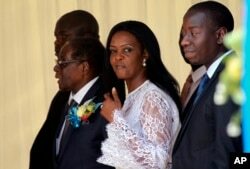 Many observers saw the move as a step toward the installation of Mugabe's wife, Grace Mugabe, as vice president. That would put the first lady in position to become president when her 93-year-old husband retires or dies. Zimbabwean First Lady Grace Mugabe, center, walks with Zimbabwean President Robert Mugabe at a ceremony to rename Harare International airport to Robert Gabriel Mugabe International Airport in Harare, Thursday, Nov. 9, 2017. At a Monday news conference, the head of Zimbabwe's armed forces, General Constantino Chiwenga, warned he would "step in" unless Mugabe stopped trying to purge the ruling ZANU-PF party of Mnangagwa supporters. Dozens have been arrested since the vice president was fired on November 5. Tuesday's ZANU-PF statement, signed by party information secretary Simon Khaya Moyo, said Chiwenga's comments were "clearly calculated to disturb national peace and stability" and meant to "incite insurrection and violent challenge to the Constitutional Order." Mnangagwa, 75, was seen for years as a likely successor to the president, and maintains strong backing in the army. Grace Mugabe, 52, has support in the party's youth wing and is believed to have engineered the firing of another vice president, Joice Mujuru, in 2014.